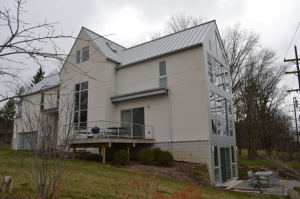 This newly constructed LEED Silver Home is located on the north side of Ann Arbor, on a 5 acre lot. The home is 4,500 square feet with 6 bedrooms, 2 ½ baths, and has a walk-out basement. 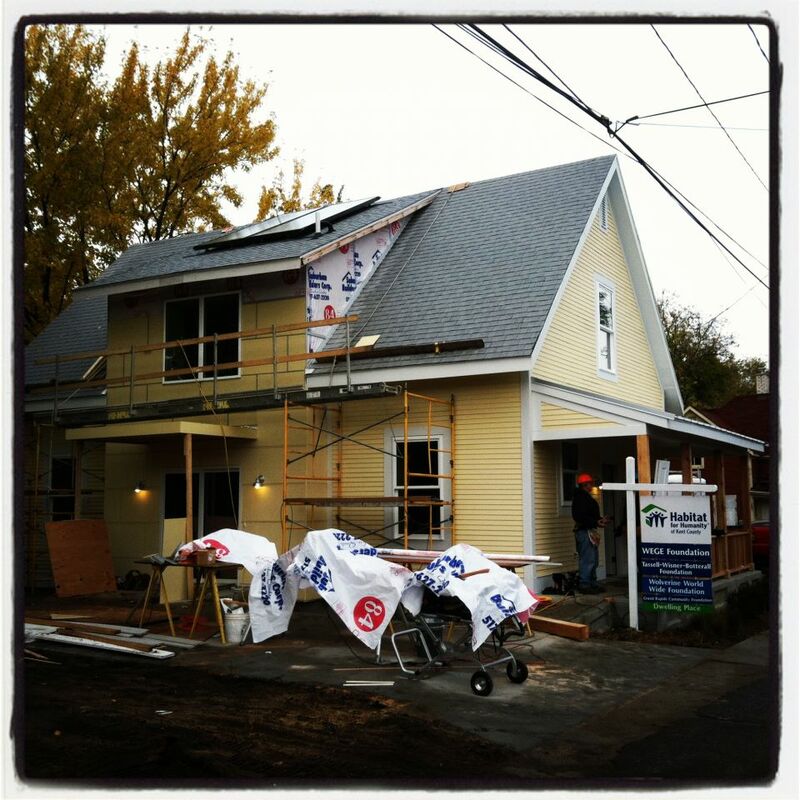 The project team wanted to build a very energy efficient, comfortable home for the family to raise their children in. Throughout the project, the team emphasized purchasing sustainable materials including adhesives and sealants with zero Volatile Organic Compounds (VOC’s) to attain a higher air quality. They worked with a HERS rater to hone in on their energy efficiency strategies. Northern Michigan Oak hardwood flooring was used throughout the first floor of the home because of its close proximity to the project. All carpeting and underlayment were Green Label Plus certified by the GreenGuard Certification Institute. Blown-in cellulose insulation, which is made up of 100% recycled newspaper fiber, was used instead of fiberglass. The fitness room boasts a 100% recycled rubber flooring and the TREX deck had a high percentage of recycled materials as well. A drought resistant turf grass mix limited irrigation requirements, as well as a wildflower mix on the perimeter of the turfed-in area. Additionally, only native species of bushes and trees were installed. The system is controlled by a RainBird Sensor that automatically adjusts the irrigation schedules if it senses rainfall. 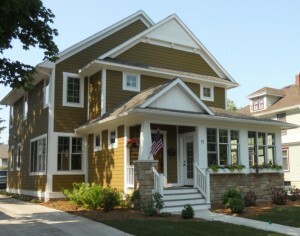 A Home Energy Rating Standard (HERS) Score of 44 was achieved for this house, which makes it in the top 10% of MI homes. The score means that the home is 56% more efficient than a conventionally built new home, and 42% more efficient than Energy Star’s standard for homes. To give you an understanding of what this equates to, the energy bill for this 4,500 sq. 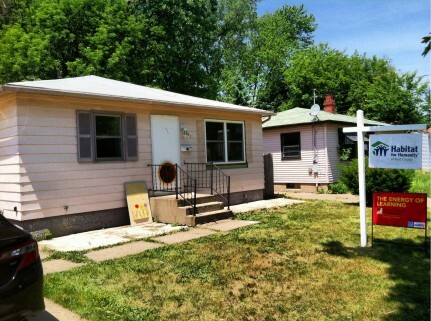 ft home during the month of July, was $110 for both electric and gas. The project team chose to focus on the Energy & Atmosphere and Indoor Environmental Quality (IEQ) credit areas to compensate for the sacrifice of Location & Linkages credits due to the projects distance from an urban setting. The high rating of LEED Silver was achieved by taking a whole systems design approach to building, and eliminating any weak points in the house. 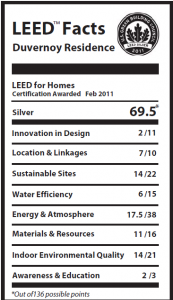 benefits and shortcomings of the current LEED for Home certification system. 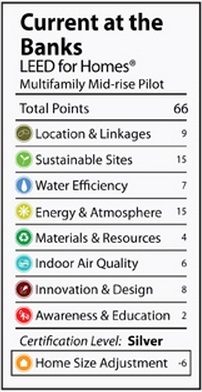 The survey consisted of various categories including (1) general satisfaction with the LEED-certified home, (2) satisfaction about the home in general and various aspects of the indoor environment, (3) overall well-being including the health impact, (4) energy efficiency and building performance, (5) the environmental behavior of residents, and (6) demographics. The findings of this study revealed that most residents of the LEED-certified home were satisfied with their home and their quality of life in their home. 1. Watch the webinar presentation by Eunsil Lee, PhD for FREE. 2. Contact to take the quiz and score at least 80% to be approved. Please also post a comment below and help add to the conversation. Two methodological approaches were used for this study. 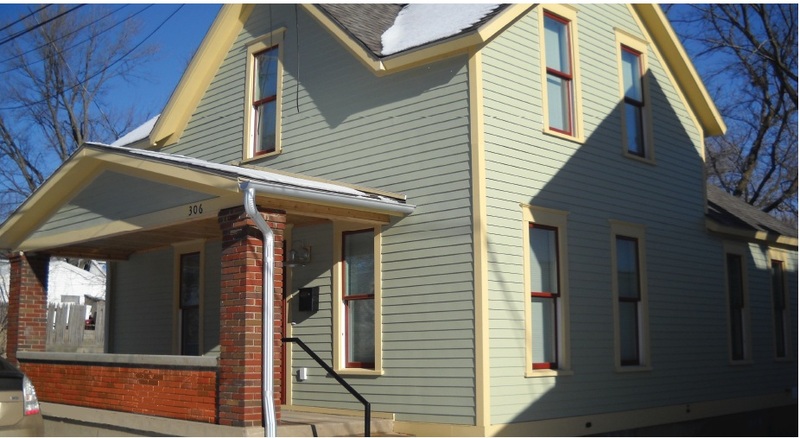 Qualitative case studies were conducted with 15 LEED-certified Habitat for Humanity residents in Kent County, Michigan through in-depth interviews, observations, and IEQ measurement. 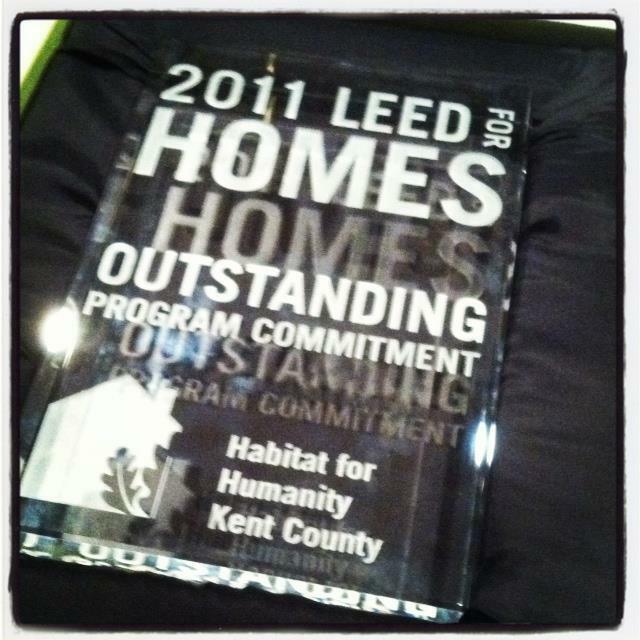 16 % respondents came from LEED-certified Habitat for Humanity homes in Michigan. These residents in particular, were more satisfied with their homes and their quality of life than residents of Non- Habitat homes were, although their satisfaction with their neighborhood and specific aspects of home environment (e.g., space layout, size of space, finishes, visual privacy, view, temperature, humidity) was lower than that of Non-Habitat residents. 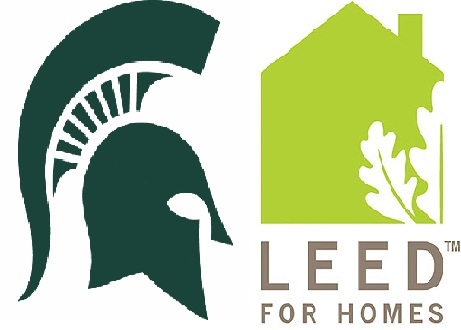 Residents of the Habitat for Humanity tended to perceive the improvement of their quality of life since moving into their LEED-certified home more strongly than residents of the Non-Habitat home did. They were also more satisfied with energy efficiency of their home than residents of the Non-Habitat home. Promote sustainability in low-income housing: More programs should be developed that can offer incentives for participation in LEED green building certification programs and increase funding opportunities to cover the initial costs of sustainable home building for low-income families at both state and local levels, because those efforts will produce long-term economic and environmental benefits. Improve the design of low-income green housing: Architects, designers, engineers, contractors, and facility managers can gain greater understanding of design and the performance of low-income green homes with the findings of this POE project by receiving feedback for the future projects. Although the houses were LEED-certified, some problems in maintaining the green features, building performance, and comfortable home environment were identified. Architects, designers, engineers, green policy makers, and Habitat for Humanity Affiliates should pay attention to the specific needs relevant to these issues to improve the design quality of low-income green home through the process of planning, design, and construction. 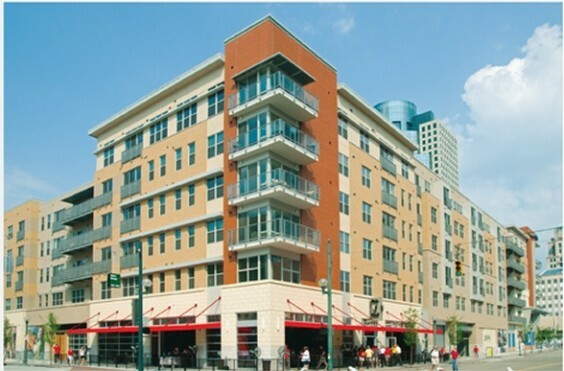 Implement Post-Occupancy Evaluation (POE): More extensive implementation of POEs is critical. Since LEED certification is based on “as-designed” performance, further implementation of POEs is exceptionally important to verify actual performance and expected performance. 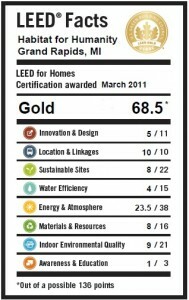 In particular, since there is no mandatory post-occupancy evaluation process included in LEED or other green home certifications, there is no empirical data to verify whether these green homes perform satisfactorily in terms of heating, cooling, or indoor environmental quality. Contribute to the general body of knowledge: Although there is a consensus about the benefits of green homes, few empirical studies about the actual effects of LEED-certified green homes on residents’ health, comfort, and satisfaction have been conducted. 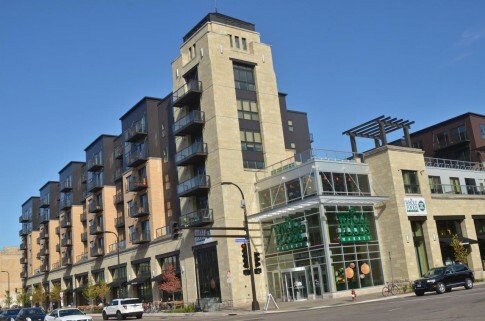 The findings from this study therefore increased understanding of the benefits to be gained from LEED-certified low-income homes by applying empirically tested, research -based knowledge. 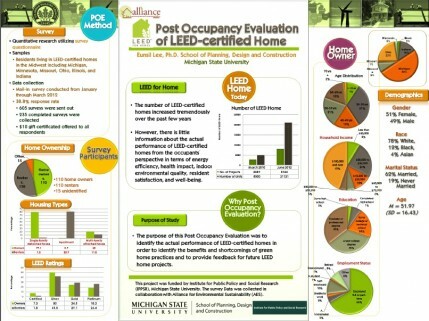 Promote public awareness: This report will educate the public about the impact of LEED-certified homes on (1) improving the residential environmental quality and energy efficiency, (2) reducing residents’ health risks and (3) enhancing residents’ comfort and satisfaction by disseminating the results of this research at conferences and by publishing articles in scholarly and extension journals. 1) Incentives for green homes, such as LEED-certified homes, Energy Star Homes, or National Association of Home Builders’ Green certified homes, should be offered to developers, contractors, and homeowners. This will be critical for both new and existing homes located in the cold regions such as Michigan to encourage energy-efficient green home constructions for low-income families in order to offer lower utility bills. 2) Policy makers should collaborate closely with local builders and developers to apply more green home features to new or existing low-income houses. 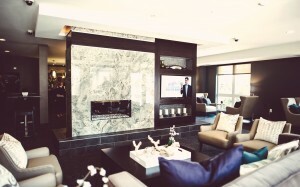 Certain types of incentives for local builders and developers are desired. 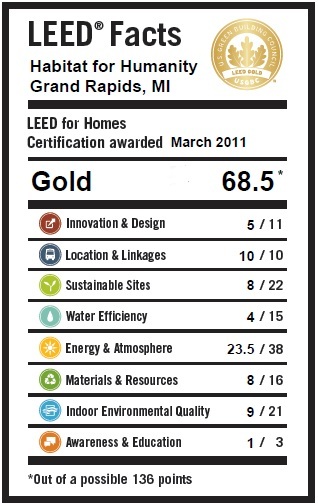 3) Post-occupancy evaluations of green certified homes should be encouraged, particularly for low-income housing. Continuous efforts should be made to save energy and keep green homes energy-efficient for these households and homeowners. 4) We suggest conducting POEs of green certified homes in five or ten years to preserve their green features and energy efficiency. Based on the POEs, the homes may or may not be repaired to keep the original functions of green features. 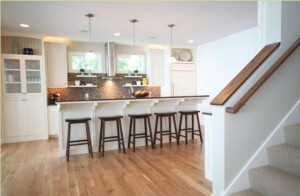 In the POEs and repairing process, local home remodeling companies can be involved. 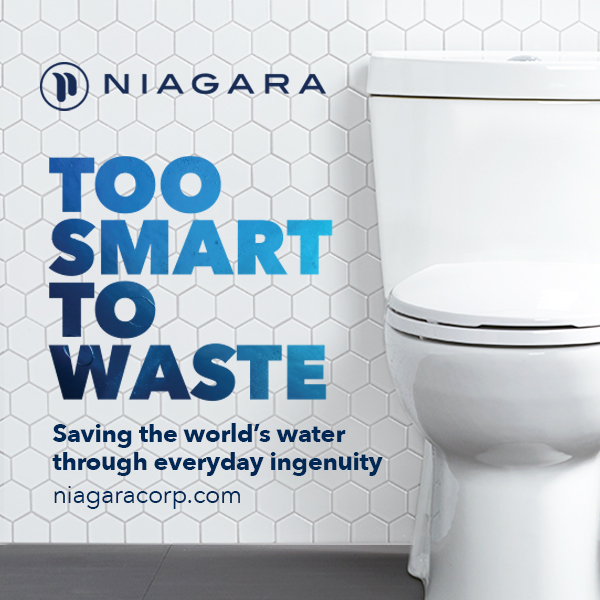 Some incentives should be considered for the local companies or businesses to be involved in this green process if they are small or micro businesses. Tax reductions for these types of companies (i.e., energy auditors, window replacement companies) can promote small entrepreneurs working on sustainable housing projects in local communities. This can create more local jobs. 5) We suggest offering regular educational seminars for residents of green certified homes in order to offer precise information about the green features of their homes and educate them how to keep their homes green. On-site seminars can be offered one or two times in the development phase and right before the new owners take occupancy. Once residents move to their new homes, it is recommended to send flyers via mail or email to remind them of the green features of their homes and inform them of how to use and maintain these features. Mailed or emailed flyers will work better than on-site seminars because many residents have full- or part-time jobs. 6) In addition, incentives should be considered for upgrading low-income housing to make it more energy-efficient and environmentally friendly. 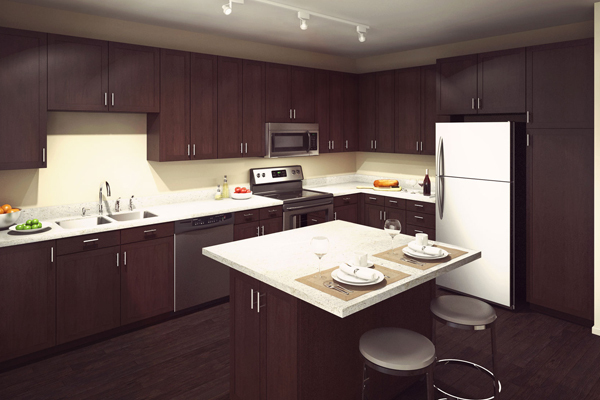 Currently there is a 500 dollar maximum tax credit for upgrading any housing features to make them energy-efficient. This maximum should be increased to keep up with the real cost of upgrading energy-consuming HVAC systems to energy-efficient ones. In particular, more aggressive incentives should be offered to households below a certain income level so that homeowners can be more active in upgrading their conventional houses to energy-efficient green ones. Thanks to the Michigan Applied Public Policy Research (MAPPR) Grant from the Institute for Public Policy and Social Research (IPPSR) and Michigan State University (MSU) who worked with to perform this Post-Occupancy Evaluation (POE). 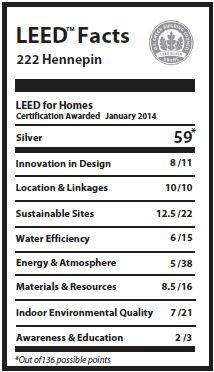 See more details on a similar LEED Pre-Occupancy Report. Many states are in the process of adopting in whole or with modifications the 2012 International Energy Conservation Code (IECC). This new code raises the bar in construction design for residential and commercial structures, and as a result, architects / engineers / contractors building to the new code will be affordably offer a choice to their clients for pursuing several above-code certifications such as Energy Star and LEED without too much additional effort or cost. The new national energy code includes mandatory blower-door testing for building air leakage (less than <3.0 ACH at 50 pascals), which will measure how well contractors have sealed up penetrations between the outdoors and indoor conditioned space. This testing will be required for all projects permitted after the new code goes into effect. Some states have made modifications to the adopted code, such as Illinois which has changed the ACH rate to 5.0 ACH @ 50. 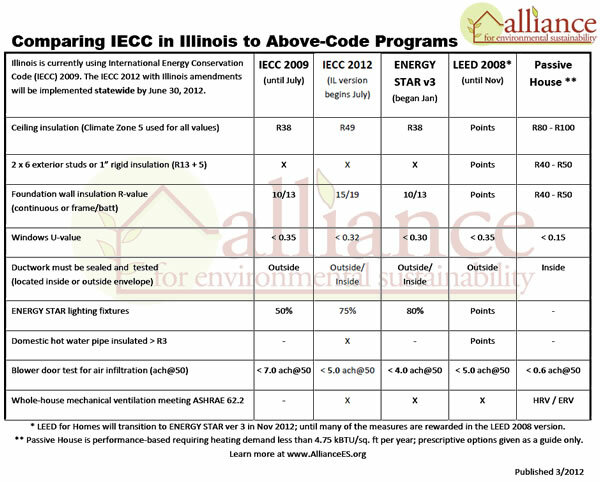 View our archived July 12 webinar to learn more about IL Energy Code changes. Other aspects of the 2012 IECC such as requiring hot water pipe insulation and mechanical ventilation are new items that projects will need to implement. Learn more on a free webinar held Thursday July 12. 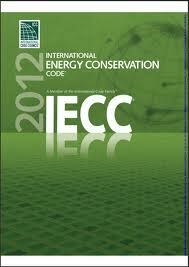 So, how do national IECC 2012 requirements relate to voluntary above-code programs like Energy Star, LEED and Passive House? Pretty well actually. 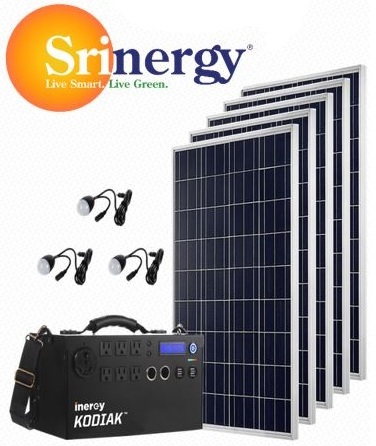 has assembled a matrix identifying several energy-related items as written in the code and indicated what the impact or requirements would be in one of these above-code third-party green certification programs. Download national comparison matrix as PDF. What does this mean? Well just by building to the new code, these projects will be very close to meeting the Energy Star for Homes program requirements, and will score very well in programs that require Energy Star version 3 such as LEED or Green Communities. Other green programs that don’t require Energy Star, such as National Green Building Standard or local green home programs will also heavily reward these projects. LEED for Homes will be requiring Energy Star version 3 beginning at the end of the year, so right now a project can still earn LEED certification by building to Energy Star version 2 requirements which should be easily met on any home that meets IECC 2012. Take advantage of this sweet spot and earn market recognition by attending a LEED workshop or sign up to earn LEED certification today! This home dramatically reduces it’s HVAC energy requirements by using airtight building principles. 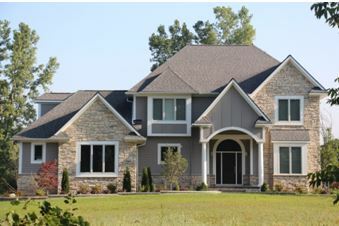 This home utilized geothermal forced air cooling and geothermal hydronic heating to further reduce HVAC consumption. Czesewski assisted with the submittals.